Toddlers are a bundle of energy, adorable and curious – always with questions as to what, why and how. Their curiosity, memory, questioning ability, teaming up with other toddlers, counting ability will have to be developed holistically. Their motor skills also need to be developed in the proper direction which will give them a strong physical foundation in life. They have to be entertained as well as their curiosity and learning ability needs to be catered to. Here, we bring you the best toddler water table designed to take care of all these tasks. 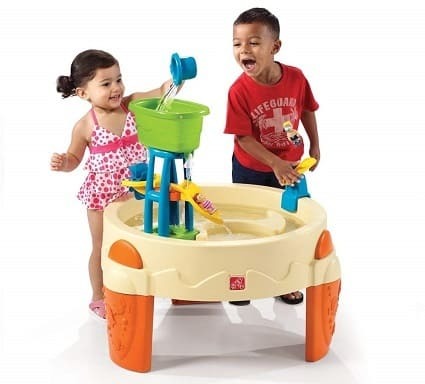 The Little Tikes Fish ‘n Splash Water Table is designed for toddlers keeping in mind the fun time they need to have at this age. As well as get them to learn to count and to improve their motor skills with the best water table game. And it is totally entertaining too. With this game the techniques which help children improve their observation and reasoning skills, learning to count – making creative thinking a part of the learning process by playing together with other toddlers. 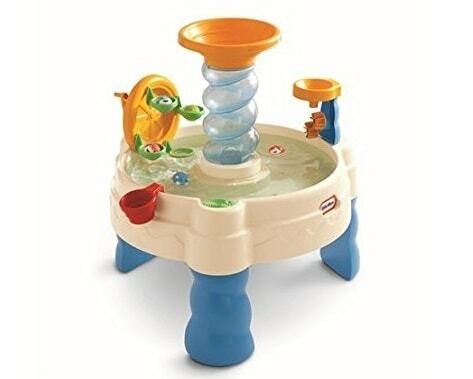 A fun time best kid’s water table – this product is a must for the toddler’s early age development. A cute, colorful and fun-filled water table for toddlers, durable; easy to assemble and to move around. The pack includes a fishing pole, floating critters, water cup and a fishing net for the toddlers to play with. The players can have a “Counting” play with the number of fish collected. They will love splashing the water around and have a merry time together. The recommended age to use this water table is for toddlers between 24 months of age and 5 years. Why will you like this toy? Toddlers from the age of 24 months till they reach 5 to 6 years can develop their motor and cognitive skills with the right amount of fun, learning and supervision. This outdoor activity game, shapes, colors, counting numbers keep them more active and their abundant energy can be used in an engaging way. Playing and sharing with other toddlers will make them more adaptive. The Step2 Finding Dory Whirlin’ Waves Sand & Water Table is designed with the “Finding Dory” theme- which was a hit with toddlers when the movie was released. Children simply loved the character “Dory.” What else than to provide the Best water table for toddlers. They would have loads of fun finding “Dory” and squealing with delight. Their motor skills of grasping, walking, running, kicking and walking can also be taken care of when they play with toys like the best kids water table. A fun filled and captivating game for the little darlings who will have a good time with the “Finding Dory” water table. It is the best toddler water table which is easy to assemble and can be used both indoors and outdoors. 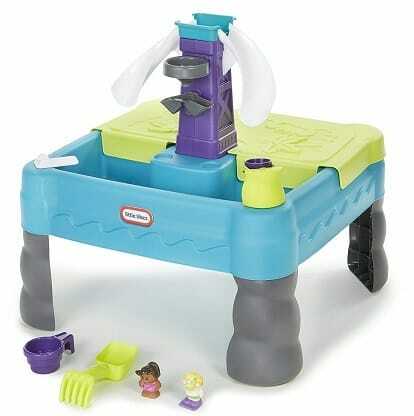 The water table is durable and contains accessory set including Dory and her friend’s figures. The toddlers can get the water swirling with the center spinner and send Dory with her friends down the slide. This water table which is an outdoor activity will make them play by themselves or with other toddlers who will pave the way for their motor and cognitive skills to grow properly. 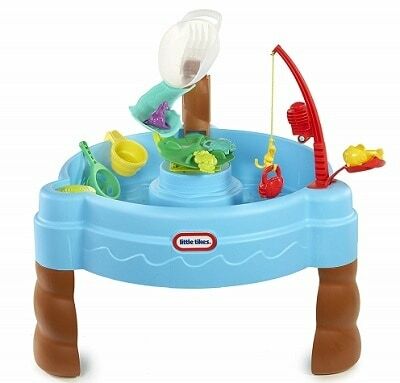 The Little Tikes Frog Pond Water Table is the best kid’s water table. The table is sturdy & with good size- keeping in mind the age of the toddlers. A perfect diversion for kids as an outdoor activity on a hot summer day. It is great for a group play and for improving sensory activities. It comes with an easy drain plug too for good cleaning. An engaging and fun time water table game for toddlers who can play with toy frogs and lily pads. They can launch the frogs onto lily pads and the center tower. Accessories provided in the pack include – five frogs, two floating lily pads and one full cup. The table has the capacity to hold up to seven gallons of water. Toys which can improve the toddlers’ motor skills, sensory skills should be encouraged from an early age. Their cognitive skills such as thinking, analyzing, computing and so on – should be taken care of by engaging them in all-round development activity. We recommend these toys which can cater to the good development of toddlers hence. 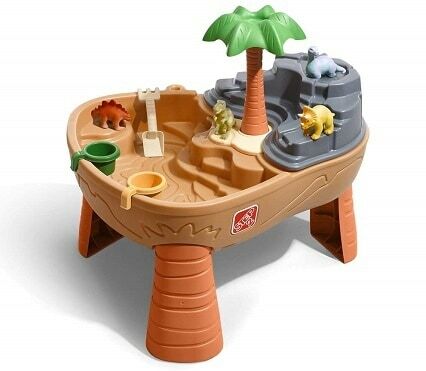 The Step2 Dino Dig Sand & Water Table is designed for toddlers – which gives them the fun they need and to keep them busy. With the best kid’s water table, toddlers can improve their observation and reasoning skills. Working in a team will become their strength by playing together with other toddlers. This product is a must for the toddler’s early age development. The stunning and most loved water table game boasts of an excellent quality of the product, easy to assemble – with two-sided table for sand and water separately. It has a sturdy exterior, compact and takes up less space with convenience to move it around. Cute and adorable dinosaur’s toys are provided which can be made to take a drink from the watering hole. The water table is good for interactive play, and 2 to 4 kids can play together at the same time. Provides hours of entertainment to the toddlers. Motor skills and sensory skills will develop well. Unknowingly toddlers can put sand in their mouth or on their head. Toddlers’ motor skills and cognitive skills can be improved. They will keep themselves busy and enjoy playing the game. The right amount of learning and supervision from elders will happen at the same time. Since a group of kids can play at the same time, “sharing and giving” in a team will also be developed at an early age. The Little Tikes Sandy Waterpark Toy is designed for toddlers, keeping this need of developing their motor skills in mind- fun by playing and learns by actions. It keeps them engaged for long hours too. It is the best kid’s water table which helps them to think creatively and encourage them to mingle with other toddlers easily. 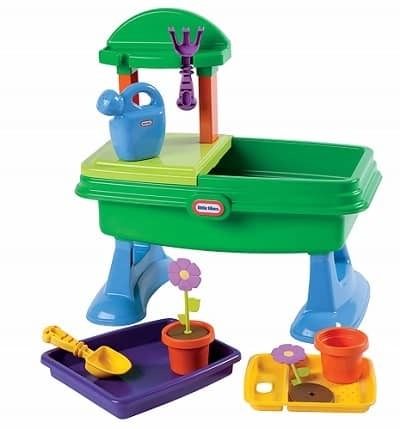 This attractive and adorable water table is colorful with both sand and water play sides. It is also elevated for standing toddlers. The product comes with excellent quality, sturdy and aesthetically designed. With the twin water slides, it is useful and good for a group play too. 2-4 toddlers can play at the same time. 2 in 1 shovel /rake, 2 inner tubes, 1 cup, and 2 small characters are provided with a built-in drain plug for easy clean up as well. Motor skills and cognitive ability will develop well. Small character toys can be a minor issue, but considering toddlers – it may be looked into. Toddlers have to be under the watchful of elders while playing. We recommend this toy since it will keep toddlers engaged, improve their observation and learning. They will have fun playing the game with others, and hence teamwork is encouraged. Step2 Big Splash Waterpark Water Table is designed for toddlers, keeping in mind the need to develop their motor skills, while group play can be encouraged too. It keeps them engaged for long hours in the backyard since it is an outdoor game. It is the best kid’s water table which helps them to think creatively, educational and encourages them to play with other toddlers easily. This colorful and attractive water table is easy to assemble, can be kept outdoors or in the backyard to inspire imaginative play. 2-3 toddlers can play together. They can pour water down the water slide. A catapult is provided which attaches to the water table, and the toys can be flipped into the pool. A drain plug is provided which can be used to drain water fast and the table can be cleaned easily. A total of 7 piece water table accessories are included – spinner, bucket, tower, catapult board, cup, and 2 figures. We recommend this toy to keep toddlers engaged and busy with their hands. This will improve their observation skills and encourages group play. They will enjoy playing the game with other toddler friends. Little Tikes Garden Table is designed for toddlers, keeping in mind the need to develop their cognitive and behavioral skills, while group play improves their “sharing” skills. It keeps them engaged for long hours in the outdoor or backyard it is the best kid’s water table which helps them to think creatively, and analytically. The charming and colorful table-top design of the water table encourages multiple child play. Bright and colorful this is very appealing for toddlers to improve their color recognition. Plant and “water” flowers basin provided can hold water. A drain plug is included for ease of cleaning. ; The lid fits over back posts covering half the basin for a table work surface. The pack includes 4 flower pots, 2 soil discs, 2 flowers, 1 tray, 1 sifter tray, 1 rake, 1 shovel, and 1 watering can. We recommend this toy since it will keep toddlers engaged, improve their observation skills and encourages group play. They will love playing the game with other toddlers, and hence teamwork is also encouraged by sharing and learning. 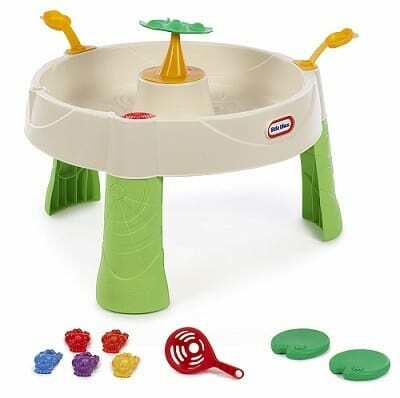 The Shady Oasis Sand and Water Play Table is the best kid’s water table and perfectly designed for toddlers, keeping in mind the need to develop their motor skills along with much other dexterity. Playing in groups can be encouraged. While they play, the toddler learns a number of skills which they can use in their later life. With a bit of ingenuity, you can select a toy and design a play that can stimulate your toddler. This brilliant and delightful water table game for kids is sturdily built and easy to assemble. 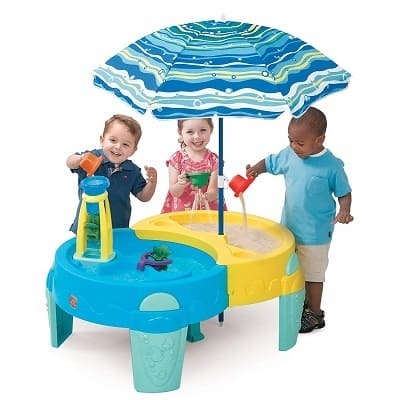 The water table for a toddler can hold both sand and water or anything else which may be put in for the toddler to play. It has a large umbrella too and easy to drag around. The water table is big enough for 2-3 kids to play at once. It has a drain plug too which makes it easier to clean. Toddlers love it; keeps them in playing for long hours – helping the mother to finish her chores! Supervision of elders will be needed at all times while playing around it. We recommend this toy since it will keep toddlers engaged, improve their observation skills, cognitive skills and encourages group play. A toddler hence will become more adaptive in the long run. The Little Tikes Spiralin’ Seas Waterpark Play Table – the best kids water table and well designed for toddlers, keeping in mind the need to develop their motor skills at an early age, with fun characters provided. The toddler gains a number of skills like, filling the cup, handling it without spilling – which makes it fun while learning. Develop early motor skills in the toddlers with adorable fun characters with the help of Water Play table. The toddlers have to drop the balls down the spiral. They can watch the balls go round and round and reach the bottom. The toddler’s observation skills are improved. The Ferris wheel can be turned to scoop up and drop off balls; enhancing the toddler’s analytical skills. To power, the twin water wheel, fill the cup with water and pour into the funnel. The pack contains 1 water cup and 5 round characters. Elders should supervise toddlers playing in the water and with small toys. Toddlers are kept engaged. It increases concentration and other motor skills; toddler will become more adaptive since he plays with other toddlers/siblings. The Step2 Summer showers Splash Tower Water Table – the best kid’s water table is spacious and well designed for toddlers to have full-time fun with their friends or siblings or alone as well. Keeps them so busy that they even forget to have their food. A parent can complete her/his chores – all the while keeping an eye on the playing toddlers. It is an easy assembly for the elders and hours of entertainment for the toddlers. And it is so much fun for the summer time. 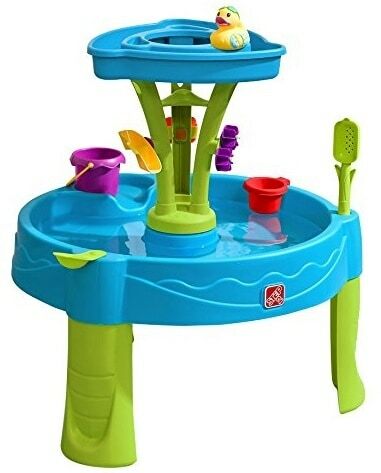 This lovable, colorful and spacious water play table allows for an overall water play fun for toddlers and the family members too! Water tower features Step2 signature rain showers splash tray. The interchangeable maze pieces allow little ones to use STEM play and create new waterfalls! This water table features a no-leak drain Plug for quick and easy clean-up. The rain shower effect makes it feel like natural rainfall. Supervision by elders is very much needed. If the water table is empty, it can topple. An optimistic toddler will grow into an optimistic and positive individual. This toy is recommended to improve cognitive behavior and other motor skills.